Sri Lanka : Dehiwela flyover needs urgent repairs: Ravi K.
Dehiwela flyover needs urgent repairs: Ravi K.
Cracks have already begun to appear in the Dehiwala flyover though it is guaranteed for 20 years, UNP MP Ravi Karunanayake told Parliament yesterday. Mr. Karunanayake who was speaking during the debate on the committee stage of the budget, said these damages could be seen on the Southern part of the fly over. “No vehicle will be able to travel on it if it is not attended to immediately,” Mr. Karunanayake said. He charged that a proper job had not been done though Rs 5.2 billion was spent on it. 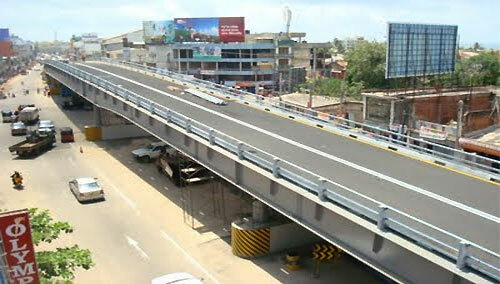 The UNP MP said traffic along the Galle Road was the same despite the flyover. He said the situation was the same in the other flyovers as well. However, Mr. Karunanayake said the Kelaniya flyover had served well as the traffic along that road had improved after it was opened. In the meantime Mr. Karunanayake referred to the development of ports stressing the need for proper identification of strategic locations for such projects. He made this point with regard to the Oluvil port which he said the government had focused more neglecting the Trincomalee harbour. He questioned as to why the government had failed to develop this port. Mr. Karunanayake said it was a crime to neglect this harbour as there were valuable assets there including 94 oil tanks. “Only 14 tanks which were given to the LIOC are functioning effectively,” he said. He also stressed on the importance of increasing competitiveness of Sri Lankan ports especially in a situation where more and more countries in Asia and Middle East have begun to focus on the marine sector. UNP MP Harin Fernando who also stressed on the importance of proper management of ports said Hambantota harbour should be recognized as an active port in the British Admiralty (BA) Nautical Charts which is an internationally accepted chart setting the standard for commercial mariners with extensive coverage of the world's seaports.” One should be aware of this situation when managing ports,” Mr. Fernando told the members in the government benches who were responding to the remarks he made on the Hambantota port.